This issue is packed with fresh, new season features and delicious recipes to make the most of all the fruit and veg that's now at its best. 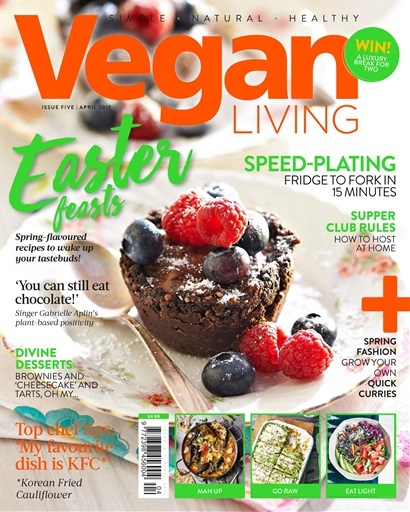 Look out for speedy, unique recipes from 15 Minute Vegan and Make a Difference - and celebrate Easter with Liz Martin's sunny delights perfect for family and friends. Continuing the Easter theme we've pinned down the producers of Adam's Fresh Chocolate for a chat and found the perfect vegan desserts for your get-together. There's also spring fashion, vegan Easter eggs, health and beauty and the best 'KFC' recipe you've ever find.